Okay, obviously beyond Data and the Soong-type androids. But seriously, we have more robots in our daily life now than there apparently are on Trek. Is there a canon answer why not? It seems like Star Wars is more on the nose in this regard - it’s unclear why all dirty/dangerous/boring work wouldn’t be done by robots (anthropomorphic or not). This isn't an in-universe answer to the question, but when I was pitching stories to Trek, I went over some storylines with my agent before pitching and was given a strict "No androids" rule. She (my agent) told me that it was Jeri Taylor's position that Data was unique and that there were no other robots or androids of that level of sophistication in the Federation. I notice this rule held, since the only other androids were Lore, Data's Mother (Juliana Tainer) and Data's daughter (Lal). There was no in-universe rationalization and I never did find out what Jeri's reasoning for that was (when you're pitching to producers, it's not exactly a good time to say, "Why did you make this rule?" - you just accept the rule and don't argue!). There were androids in TOS: the Mudd androids in the episode "I, Mudd", built "for the purpose of performing necessary service functions". Memory Alpha has a list of various self-aware machines, as well as a list of self-aware programs. These could be considered either advanced robots or simple androids due to their capacity to think and perform independent judgements. Arguably, a ship's computer (along with the whole ship itself) could be considered a giant robot, capable of interacting with it's human operators and performing various tasks requested of it. There were the Exocomps and the Nanites. Also, the automated spacedock that NX-01 encountered. I imagine there must have been more manufacturing-type robots, but we never really see that side of life in the Federation. Of course, after Exocomps and Nanites became self-aware, maybe Starfleet started frowning on new autonomous tech, wary of dealing with creating new life forms. The Doctor from Voyager basically became a robot with his personal holographic projector device. The computers are obviously sophisticated enough to support interactive artificial intelligences (holograms), it seems to me the computer could also just pipe that behavior into a humanoid robot. Even if the robot isn't independent, it would wirelessly be controlled by the computer based on the behavior of the program. Man is the best computer we can put aboard a spacecraft, and the only one that can be mass produced with unskilled labor. This is from an exploration viewpoint. Star Trek is supposed to be a reflection of what we want to do in the future. We don't want to explore the galaxy using robots because exploration by robots is a compromise. Star Trek is a society fueled by exploration. We celebrated when we sent the first probes on the moon but we celebrated even more when we sent men on the moon. We don't exactly celebrate everytime the Voyager1 space probe gets deeper into space. We don't exactly feel as 100 percent real space explorers. If we ever develop true warp drives, we wont be sending a ship full of Datas or robots to command and explore on our behalf to do proxy exploration. We will want to go ourselves with robots only in support roles. ARCHER: How about the Vulcan star charts? T'POL: We have limited data on the course Starfleet has assigned you. ARCHER: There are thousands of star systems along this path. There must have been something that piqued your people's interest. A sentient species, a trinary star cluster. T'POL: We don't select our destinations by what piques our interest. ARCHER: Vulcans always need a logical and pragmatic reason. T'POL: My people don't share your enthusiasm for exploration. (squeak) Space is vast, Captain. The Vulcans gave humans tons of data about planets and species discovered by Vulcans. But still humans insisted on doing the exploring themselves. We don't like proxy exploration not by Vulcans and not by robots or androids. I think robots and artificial intelligence is an area that writers would rather avoid. Real artificial intelligence (as embodied in any myriad of physical or audible forms) would be impossible for humans to recognize as "different" because they had been designed to perfectly imitate human intelligence. That obvious identity ambiguity would be extremely problematic for a writer trying to create a story populated by Joseph Campbell-ish archetypes. They would be servants. slaves, and thus evoking unpleasant social memories and associations. And the obvious question arises: what if they become self-aware? This is probably why the "no androids/no robots" edict came about. The ambiguities would be problematic to story development, especially when you have a small group of defined characters Although I believe the infinite possibilities (and I've already written many) would present a huge and dynamic world of endless and fascinating narratives. Nanites are a type of robot and got a story or two in TNG. I seem to remember there being a repair bot type of thing in one TNG story as well. And of course, the Borg are robots after a fashion (more cyborgs, really though). From a pure 'TV production' standpoint, it could be that without all of the CGI technology that is available today, that it was impractical (given time and budgetary constraints) to have the art department create robots. Back then there was no way to make them move without being clunky or hokey looking, although I think that it's an area that could have been explored, especially a robot that was a left over from an alien race, perhaps an alien race that has long perished, yet the robot it still performing it's function. As both a filmmaker and a Star Trek fan, I'm seriously considering making a fan film with an alien robot. I would argue - in line with the other answers here - that there are robotic devices in ST, but they are different and more ubiquitous than we see today. The Borg are roboticly enhanced, the Doctor is a holographicly driven robot, I am sure that there are robotic features making the ship function year on year that we never hear about. And the Borgs Nanobots - they are robots, of a sort. Replicators - surely they would count as manufacturing robots. What there is not much of is visible or anthropomorphic robots, because they do not need to be visible or human-like. Humans are better at it than robots, so - apart form a few exceptions - let the humans get on with their parts. And there are relatively few dirty/boring/dangerous jobs left, for a vessel of that size. Some of the routine work, I would argue, is retained for a sense of discipline and order. And the human maintenance work is done because humans are better at bug-fixing-type problem solving than computers. And yes, sometimes people need to be in difficult situations for plot purposes. But that is a completely different issue. 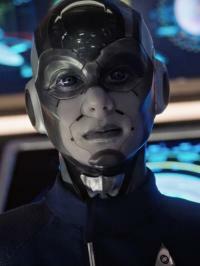 Lieutenant Commander Airiam from Star Trek: Discovery is at least in part robotic, even if her true nature is a bit unclear and not fully disclosed. She has been described in various ways, from "synthetic-Human hybrid", to "augnemnted alien" to "augmented human", but it appears rather clear that she is at least in part cybernetic. In the TOS era, there are examples of both human-made AI and alien-made AI (sometimes in anthropomorphic form e.g. "I, Mudd", "What are Little Girls Made of? ", sometimes in the form of "space furniture" e.g. "The Ultimate Computer", "The Return of the Archons"). Undesirable actions - blowing up friendly spaceships, hijacking (or threatening to hijack the Enterprise), killing, imprisoning, or threatening to kill or "absorb" members of the Enterprise landing party, etc. In the Start Trek universe, androids as capable as humans without flaws that make them downright dangerous are very difficult things to create. It took until TNG era for Data to appear, and his creation was so difficult he remained a unique artifact. His close copies Lore had a more human-like manner but was thoroughly antisocial, and B4 was next to useless until he effectively had Data's essence downloaded into him, ambiguously becoming replacement Data. Out-of-universe, Data's role is to look upon humanity as an outsider amongst the (mostly) human crew; we only need the one viewpoint, so there is need of only one "Data". And, Star Trek is about human adventures in space. If there were lots of "good" robots, it could easily make the humans seem superfluous, and so much for the adventures of humans in space. Even though we have lots of robotics in our modern world, Star Wars-like robots may be very far into our future, beyond the Star Trek settings. To imbue a mechanical device with the sort of adaptive behaviors we see in R2-D2 or C-3P0 would make it unpredictable. If you can't predict the machine's behavior, how much confidence can you place in it choosing to do the "right" or desirable thing when a human life is on the line? And without such adaptability, how useful would it really be? To get it right could take many, many decades of further development. Star Trek may have gotten it right but for the wrong reasons. The absence of robots in Star Trek served storytelling, but might turn out to be more-or-less right. The Federation has evolved beyond robots. They deal with advanced computer technology with self aware systems. The super system known as "Computer" is the Federations main source of robotic intelligence. Why robots are not used by other alien races is a mystery, theres no reason why that is missing from the Star Trek mythology. Perhaps they are universally impractical. Not the answer you're looking for? Browse other questions tagged star-trek robots or ask your own question. Is Airiam supposed to be a robot or android? Why aren’t remotely-controlled robots used in Star Trek? How many different Soong robots were there? Why are there so many warlike races in Star Trek? Why are there slave girls in Star Trek?